Edelweiss Summary: Three high school girls become the avenging Furies of Greek legend. 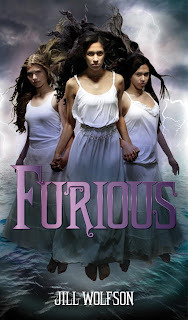 Why am I waiting on Furious? I can’t resist books with Greek mythology and have not read a book where the furies were the main characters. I’m also surprised that the girls on the cover look like real high school girls instead of overly madeup, highly airbrushed super models. What books are you waiting on? I'll have to add it to my to-read list! O M G!!!! I have never heard of this which is strange because I LOVE all things mythology! I will DEFINITELY be adding this to my TBR pile right now! Great pick! This sounds phenomenal! I love Greek Mytholgy and especially mixed into the modern world! Totalyl going to add it to my pile! I am a huge fan of Greek Mythology! I think I will be adding this to my TBR list. Thanks for sharing! Here is my WoW for the week. There are so many things I love about this book: Greek mythology, three girls working together, one is named Stephanie, life in California. Can't wait! I had never heard of this one! Interesting premise though. Greek mythology has been a popular theme in fiction in the last couple years and I am not yet tired of it! Hi, great blog! I'm a new follower and would love a follow back!